The Hotel Balestri is a 4-star boutique hotel with a great atmosphere overlooking the River Arno. A short walk from the Ponte Vecchio and Uffizi Gallery, it is located in the Santa Croce area. Having been totally refurbished, the building retains all the architectural charm of its period. The communal areas of the hotel have an elegant and nostalgic mood with Art Deco-style furniture, large windows, vaulted ceilings, large mirrors, and marble flooring. Drinks and light snacks are served in the bar area with comfortable seating. Thanks to the recent restyling, the 50 rooms over five floors are spacious and elegantly furnished, having received great attention to detail and every kind of comfort. Many offer privileged views of Florence with the most exclusive having romantic private terraces overlooking the river. 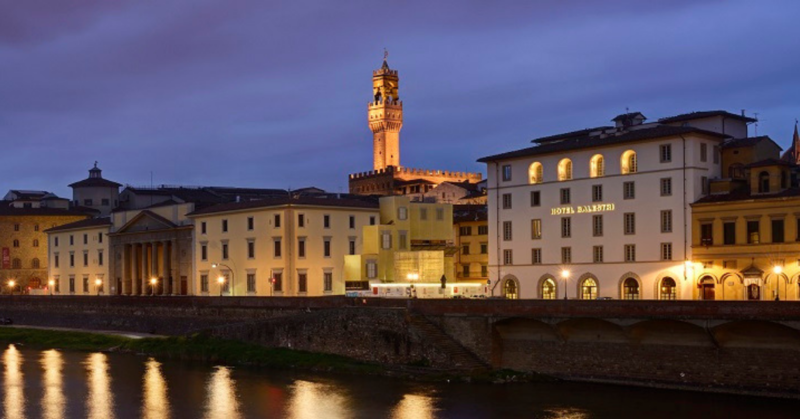 From the rooftop terrace, guests can admire the Cathedral, Giotto’s Bell Tower, and Palazzo Vecchio.